This week’s Heard on Weibo offers translation of postings about the violence in Huzhou, Zhejiang province, where store keepers revolted against increased taxes; China should provide nuclear protection to North Korea; a young man being arrested for founding a pro-democracy website; what is “dignity”; and the continued activism to free the blind rights lawyer Chen Guangcheng (latest NYT report here and two powerful video clips: here and here). Click on date below item for link to the original. Si Ma Pingbang/司马平邦/(Another famous Wu Mao—五毛)：【Can’t let North Korea become Libya】Having witnessed the fall of the wealthy Gaddafi regime that once leaned toward the west, China must come to the realization that its biggest crisis comes actually from the Korean Peninsula, and if the North Korean regime collapses like Gaddafi, it will be a fatal disaster for China. Therefore it is time to provide nuclear protection to North Korea. The interest group in the Eurasian continent led by China must stay solid, and China is responsible for itself only when it is responsible for this group. 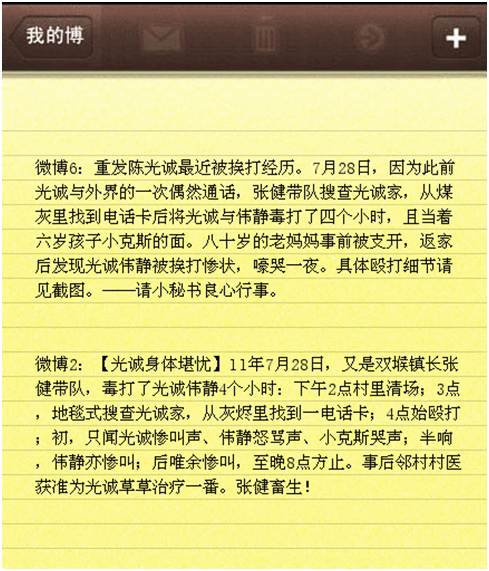 Weibo 6: Repost the event of Guangcheng being beaten recently. 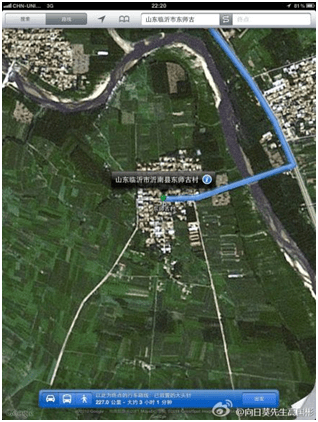 Because Guangcheng had managed to make a phone call earlier to the outside world, on July 28, , Zhang Jian and a group of men led by him searched Guangcheng’s home. When they found a calling card in the coal ash, they beat Guangcheng and Weijing [CGC’s wife] for 4 hours in front of their 6-year-old daughter. 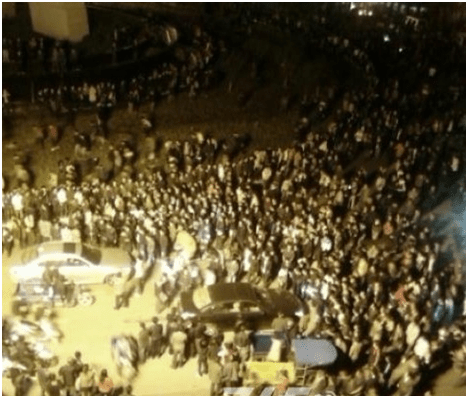 His 80-year-old mother had been sent away beforehand, and, when she returned and found Guangcheng and Weijing being severely beaten, she howled throughout the night. See screenshots for details. —-Little Secretary [Sina Weibo administrator’s name], please do what your conscience dictates. Reservist for the Founding of Army/建军伟业预备役/jian jun wei ye yu bei yi/(netizen, visitor to Linyi): Someone called my room a moment ago asking what I was doing here in Shandong. I said I was here to visit Chen Guangcheng. She said Chen Guangcheng was a spy, and I asked her what evidence she had. She said she had enough evidence but she was not obliged to show it to me. She warned me to mind my own business, and she said her people knew everything said on my Weibo. Is this a threat? In addition, why are they doing this since Linyi municipal government supposedly granted permission for my visit? A satellite view of Dong Shi Gu, Linyi, Shandong. Wang Keqin/王克勤/(Investigative journalist)【Thoughts on Dignity】At the mention of the word “dignity”, I would see, in my mind, the eyes of those who pleaded kneeling on their knees and the things that happened to them and cannot be wiped off. I would hear what many petitioners and help-seekers have told me: “All we ask is for the government to treat us like human beings.” And I would also recall countless awkward, helpless and humiliating scenes many of my fellow journalists and I have experienced. @tengbiao Teng Biao/滕彪 /Chinese rights lawyer Fu Guoyong/傅国涌(author, web commentator): From Zhai Qiao village (寨桥村) in Le Qing (乐清) to Dong Shi Gu village (东师古村) in Linyi (临沂), from Qian Yunhui (钱云会) to Chen Guangcheng (陈光诚), one in the south and the other north, in two different villages, the fate of these two ordinary Chinese paints the truest picture of our time. And they represent today’s China more than the mega films, countless lavish jamborees, GDP numbers and Confucius Colleges. If you don’t know what have happened in Zhai Qiao village and Dong Shi Gu village, you couldn’t possibly understand China. By T in Uncategorized on October 30, 2011 . 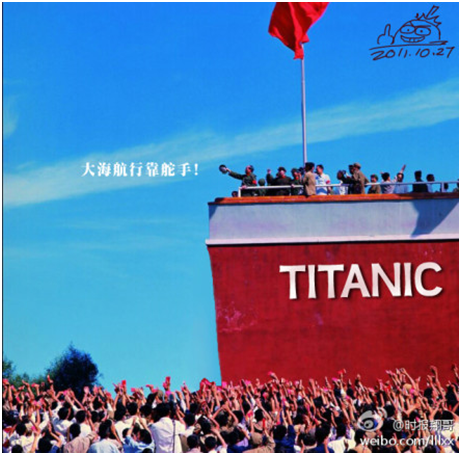 It helps to know that “大海航行靠舵手” (“It is the helmsman who steers the [ship] sailing on the sea”) is a common refrain during the Cultural Revolution. So seared in my memory that I can still sing it readily now. It should be his son instead of daughter. @B, I did the translation. Everywhere I have heard, Chen Guangcheng has a daughter, not a son. In the Chinese original Weibo item (image included in post), his daughter is referred to as “孩子”, which means “child” and can be either girl or boy. Sorry, I’m wrong. It was his daughter. However he did have a son. I read this, by Zeng Jinyan, their friend and Hu Jia’s wife http://www.boxun.com/news/gb/pubvp/2011/10/201110222211.shtml and the sentence “his son watched multiple times Guangcheng was beaten” left me with the impression his son watched this. You are right, this time was his daughter. No need to apologize. I am glad you mentioned the son because I wasn’t even aware that he has a son. Apparently he did, and the boy (克瑞）should be around 8 years old and the girl (克斯）6 now. Right now, I am reading 滕彪’s 《暗夜里的光明之舞》http://blog.boxun.com/hero/2006/tengb/3_1.shtml, and I kept thinking, he is the one chosen to toll the bell. I read this too, thanks for referring to this. it’s touching. the title is well selected and the lines where the title came, imaging chen like a dancer evading those after him in the dark woods, has something both romantic and heart breaking. I want to translate this into English. mind I send the translation to you and publish it here? I cannot bear doing nothing it’s all for myself. but the translation will come slow as I am a slow mover. I am working on a profile of CGC to be published the coming Saturday and Sunday here. Teng Biao’s writings will be a main source. Thanks for the offer though: I feel your urge to do something. I am hoping congressman Chris Smith will be able to make the visit (see my link in the latest Heard on Weibo). Hopefully the mounting pressure from citizens and all over the world will get the Chinese government to re-think what they are doing. that’s good. guess you will put teng biao’s article into what you are working. I will do other things – though small comparing to what chen and those lawyers did – to appease my uneasy conscience.